Most of us think that history is the past. It’s not. History is the stories we tell about the past. Those of you who have followed my blog for a while know that I don’t read a lot of non-fiction. I can’t help it- I just prefer fiction. So does Thomas King. Truth be known, I prefer fiction. I dislike the way facts try to thrust themselves upon me. I’d rather make up my own world. … for me, at least, writing a novel is buttering warm toast, while writing a history is herding porcupines with your elbows. … in consideration of those conversations and the respect that I have for history, I’ve salted my narrative with those things we call facts, even though we should know by now that facts will not save us. After reading such an engaging prologue, how could I not continue? I have had this book on my list for some time now, but thanks to it making the Top 5 Canada Reads list I finally decided to read it (sometimes, I can be convinced), and, if I could, I would quote most of the book for you. It is packed with interesting, eye-opening information and stories about the relationship between “Whites” and “Indians” over the past 500 years. I don’t even know where to start, there are so many things to say. I think I will just let Thomas King speak for himself. I simply have difficulty with how we choose which stories become the pulse of history and which do not. 2. The cultural history of Indian/White relations over the years: The portrayal of the “Indian” is the “White” people’s idea of them, rather than a true reflection of who they are. Tonto (from the Lone Ranger) was North America’s Indian. Trustworthy, loyal, helpful, friendly, courteous, kind, obedient, cheerful, thrifty, brave, clean, and reverent… Tonto was the Indian that North America had been waiting for, the Indian that North America deserved. After all, Europeans had brought civilization to North America. They had shared it with Native people, who hadn’t been as gracious about the gift as they might have been, and one could argue that Tonto was North America’s way of thanking itself. What we watched on the screen over and over was the implicit and inevitable acquiescence of Native people to Christianity and Commerce. No matter what happened, the question that was asked and answered again and again on the silver screen was: Can Indians survive in a modern world? And, the answer, even in sympathetic films such as Broken Arrow, Little Big Man, and Dances With Wolves, was always: No. And when we dance, when we sing at the drum, when we perform ceremonies, we are not doing it for North America’s entertainment… We do these things to remind ourselves of who we are, to remind ourselves where we come from, and to remind ourselves of our relationship with the earth. Mostly, though, we do these things because we enjoy them. And because they are important. As North America began to experiment with its “Indian programs”, it did so with a “one size fits all” mindset. … they (“Whites”) get to make their mistakes as individuals and not as representatives of an entire race. 4. 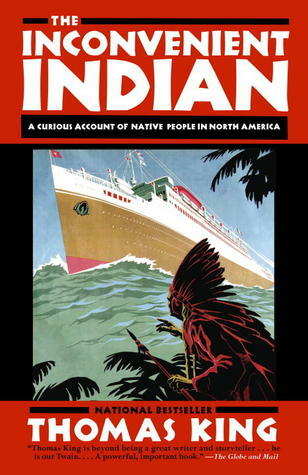 “Throughout the history of Indian-White relations in North America, there have always been two impulses afoot. Extermination and assimilation.” This thinking is what eventually led to relocation and residential schools. In 1892, Richard Pratt’s plan was to “Kill the Indian in him, and save the man”. And, we all know how residential schools worked out. Richard Pratt was wrong. As it turned out, if you killed the Indian, you killed the Indian. … despite the apology, North America’s paternalistic intervention in the lives of native people continues unrepentant and unabated. But, of course, there’s a perfectly good reason for this intervention. Native people can’t look after ourselves. We don’t have the capacity to manage our own affairs. We don’t know what’s good for us. We haven’t the level of sophistication to understand the workings of the contemporary world and to participate in a modern economy. Somebody once told me that racism hurts everyone. Perhaps in the broader sense of community, this is true. All I know is that it seems to hurt some much more than others. Racism is endemic in North America. And it’s also systemic. While it affects the general population at large, it’s also buried in the institutions that are supposed to protect us from such abuses. Thomas King goes on to give several examples of racism coming from these institutions, as he does with all his claims throughout the book. The book is packed with these kinds of stories. 7. The fight over land: In chapter 9, King provides us with 6 eye-opening stories illustrating the question of land between “Natives” and “Whites”. From a Native perspective, Indian land is Indian land. From a contemporary, somewhat legal North American perspective, Native land is land that belongs to the federal government and is on indefinite loan to a certain category of Native people. To say that these two views are in conflict is to state the obvious. Land has always been a defining element of Aboriginal culture. Land contains the languages, the stories, and the histories of a people. It provides water, air, shelter, and food. Land participates in the ceremonies and the songs. And land is home… For non-Natives, land is primarily a commodity, something that has value for what you can take from it or what you can get for it. Two fictional books I have read recently that illustrate the importance of land for First Nations, and the fight over it in the past and present are The Orenda and Smoke River. Ignorance has never been the problem. The problem was and continues to be unexamined confidence in western civilization and the unwarranted certainty of Christianity. And arrogance. Perhaps it is unfair to judge the past by the present, but it is also necessary. 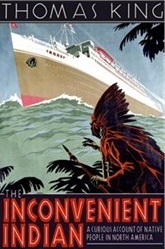 The Inconvenient Indian is some non-fiction that I can get behind. It is smart, funny, interesting, and illuminating. And, even though it seems like I have already told you everything in the book, this post is really only just skimming the surface. In Joseph Boyden’s words (from the back of the book), “For those who wish to better understand Native peoples, it is a must-read. For those who don’t wish to understand, it is even more so”. Thomas King was born in California and now lives in Guelph, Ontario. He has won or been nominated for many awards and honours, including the National Aboriginal Achievement Award, the Governor General’s Literary Award, the Trillium Book Award, the Commonwealth Book Prize, and the Order of Canada. Some of his other works include Green Grass Running Water, The Truth About Stories: A Native Narrative, Medicine River, and The Back of the Turtle. This is a man I would love to meet. Have a listen to Thomas King talk about his book on The Next Chapter. I think his is the first book discussed. (Just this week). Thomas King mentions him in this book, actually, I have not read anything by him, yet, though. His style sounds a lot like King’s – King is also very funny, and a born story-teller. I’ve been wanting to read this since I first heard of it, so I love seeing a great recommendation like this. I think the topic can be tricky and come off really poorly if not done well, but it sounds like this is an example of how it can be done right. He did this so well. And, he makes it perfectly clear at the beginning that this account is full of his opinions and that he prefers to inform of us the past using story-telling rather than pure facts. This style worked well for me, as it made the whole thing entertaining as well as informative. It sure sounds like there is a lot packed into this book, but based on your review, it does seem like a must-read. It is easy to forget that history is almost always told from the viewpoint of the “winner” or strongest group, so it is always eye-opening to get the perspective of the “others.” I have never considered that in many popular portrayals of Native Americans, e.g., Dancing With Wolves, the message is that Native Americans cannot survive in the modern world. I know! When I watch those movies, I find them powerful and moving, but I never once thought of the real message that is being told over and over again. It is the same with art – we have ideas and pictures in our heads of what Native Americans should look like and be like based on the artwork we have seen over and over again. But, most of the art that we picture was created by Europeans based on their own ideas of what the Natives were/are like. So interesting! Thank you for the review. This book is on my ‘to read’ read list. Y have heard Thonas King interviewed several times and he comes accross as a very intelligent, humane and articulate man in addition to possessing a great deal of common sense. Thank you for the review. This book is on my ‘to read’ read list. I have heard Thomas King interviewed several times and he comes accross as a very intelligent, humane and articulate man in addition to possessing a great deal of common sense. I also loved listening to his interviews. He is entertaining and full of interesting things to say. He’s not afraid to voice his opinion, but is able to do it in a gentle way. He is a born story-teller, I think. I am one third of the way through The Back of the Turtle and love the story and Thomas King’s style. Now I have to put The Inconvenient Indian on my ever-lengthening reading list. You are ahead of me on his fiction – I have yet to read one of his novels. I own Green Grass, Running Water but just haven’t gotten to it yet. It’s good to hear you’re enjoying his latest! Hmmm, this sounds interesing. Have you ever read Bury My Heart at Wounded Knee? Boy, is that a terrific book! No, I haven’t, but I will be sure to look it up! Wounded Knee is mentioned several times in The Inconvenient Indian. I think I read it the first time when I was in my 20’s. I was in tears for a large part of the book. Wow, you broke your non-fiction ‘guideline’ for this! This sounds like a big book, the kind of book that we should all read. I do think it’s the kind of book that you have to kind of be prepared to read because as you say, it’s challenging. Great review – I didn’t know very much about this book before! Thanks! This book has been on my to-read list for quite a while, but thanks to Canada Reads I was ‘forced’ to read it (in my own way of thinking), and I am happy that I did. It is non-fiction, but he is so entertaining and there is a lot of humour in this book, which also helps to make it not so maddening and depressing (which this topic could easily become). Our adopted grandmother, Vi Hilbert, was an Upper Skagit elder who we met through storytelling. She was born in a time when they were still taking children away from their parents and punished for speaking their native tongue. She went on to make a dictionary to preserve her language and write the stories down before they could be lost. She said, “Our stories tell us who we are.” The Inconvenient Indian sounds like it tells stories that need to be heard, and I will put it on my list. Your story reminds me of one of the things that struck me when I was reading The Inconvenient Indian – that after all these years of racism, suppression, and being ignored, the First nations communities and individuals have not given up. Some of the land claims they have been fighting for have gone on for decades. I can’t imagine what it must feel like. Thomas King is also a born story-teller, and some of his fiction books might be of interest to you as well. Thanks for your story about Vi Hilbert! Hi Naomi, Melanie (GTL) told me to get up here and have a look. I picked out this post because so much of what you read and write about is completely unfamiliar to me. But we are having exactly this discussion in Australia right now, perhaps with the difference that ‘we’ were all certain until right up to the 1990s that Aborigines were a dying race. I’m happy to say that there are now vibrant Australian Indigenous art (painting) and literature cultures. But as apparently in Canada, the big problems are systemic, built into the way governments deliver health, education, policing and welfare to remote communities. Ways which are designed to force assimilation rather than accommodation. In passing, I do think I have reviewed a couple of Canadian books – one by Leonard Cohen and one or two by Margaret Atwood. Hi Bill! Sorry it took me two days to get back to you – I’m having a busy month. But I have seen you around Melanie’s blog and enjoy reading your comments on her posts. I’m happy you came over for a visit! You’re so right – Canada and Australia seem to have similar Indigenous issues. Let’s hope we’re both headed in the right direction with it!